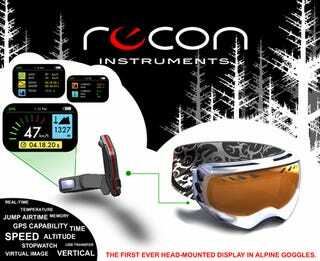 These goggles pack a display that projects info like jump hang-time, vertical gain/loss, and speed. Perfect, I've been looking for a way to tell how much faster that little kid who just shot by was going. There are even plans to build in resort trail maps, which would make it super easy for me to find the bunny slopes. And let's not forget the greatest feature of all. If I'm watching 6-year-olds rocket past me, knowing that I'm wearing a $450 pair of goggles might save my last ounce of self esteem. Or make me much, much sadder. Either one.